A lifestyle blog sharing creative ideas for your home. 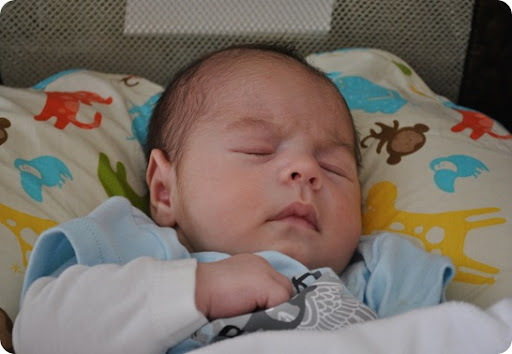 I am totally LOVING my time at home with him…and his expressive little eyebrows. He scowls at us a lot! We just laugh! My House Haven Tour series will begin again on March 6th. I can’t wait to share the beautiful, inspiring homes of fellow bloggers. Every Tuesday will be a treat! Gotta Love that! I am loving Dr. Bonners Lavender Soap. I use this on our little guy and just love the smell! I can’t get enough of Adele right now. Just love her music! I am loving this book and the new mom book club that I hope to attend in a couple weeks. 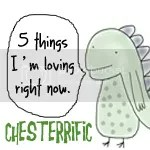 Join in the fun over at Chesterrific! Thanks for joining the party! I love Adele, such beauty! Your little one is adorable! I haven't read that book yet, fear it will be too hard to get through … will you do a book review after, I'd love to know what to expect.